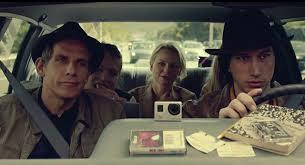 While We Were Young, by Noah Baumbach, is an amusing comedy, but it seems to be trying to be more than that. It is successful in the scenes handled with a lighter touch, but the attempts at meaningful darkness fall short of success, interesting though they are. Josh (Ben Stein) and Cornelia (Naomi Watts) are a married couple in their mid-forties. Josh is a documentary filmmaker; Naomi is the daughter of a famous documentarian, Leslie Breitbart (Charles Grodin), and produces his films. In a film class he teaches, Josh meets a married couple in their twenties, Jamie (Adam Driver) and Darby (Amanda Seyfried, providing the most depth to her character). Jamie approaches Josh after class, claiming to be auditing the class. Josh says that this is impossible, since it is an adult education course and there is no auditing, but he is taken with the couple and so ignores this warning sign. On one level, While We’re Young is about the older couple’s mid-life crisis, one not necessarily brought on by their friendship with the younger couple but intensified by it. If writer/director Noah Baumbach had kept it at that level, I would not have been disappointed. It is a light and at times quite amusing film. But there are moments at which he seems to be reaching for something deeper and darker, concerning integrity, manipulation of human relationships, even the relationship of art to truth. At the end, though, these interesting portents, while not totally undermined, come to not very much because of the final, overall softness of the film. If the film is somewhat Woody Allenish, it is not so in the tradition of Allen’s more serious comedies (e.g. Manhattan, Husbands and Wives). Lightness triumphs over incisiveness, but the darker moments indicate the potential for something deeper and more substantial.